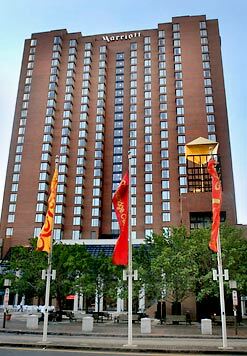 BioInnovations 2011 will be held at the Boston Marriott Cambridge, a hotel located one block away from the MIT Sloan campus. The conference will take place on the second-floor conference center of the hotel. Please take the escalator or elevator up to the second floor; the registration table will be next to the Grand Ballroom. From Boston, take the Longfellow bridge across the river to Cambridge. The Marriott will be on your left after the first set of lights. From Cambridge, take either Main Street or Broadway toward Boston. The Marriott will be just past Ames Street. Parking Fees: On-site parking is available for $8 /hour, or $23/day. Access to Sloan from Logan Airport on the T is just as straightforward. Take the Silver Line to South Station and then board an outbound Red Line train. The Kendall Square stop is just four stops away. ©2009 MIT Sloan Healthcare Club | Help?